Despite a tide swell in intercultural communication and worldwide immersion in social media, the current field of intercultural communication itself seems static. This blog post articulates five ways in which the field appears to be moving too slowly for the world around it. The word used for the kind of intercultural intervention that leads in the direction of stereotyping is called “essentialism.” One tends to assume that a certain person must inevitably share certain cultural characteristics or behaviors if they come from a particular group, ethnicity or culture. Saying that I am from the USA or that I am German or Nigerian makes a whole mess of things stick to me as stereotypes. Of course, we do have cultural characteristics, but who has them, to what degree as well as when, how and where they’ll be expressed is what we don’t know, and is what we need to learn about each other as we work together. Moreover, we belong to multiple cultural circles that may define us in variable, even contradictory ways. Interculturalists loudly condemn stereotyping but seem less adept at escaping from delivering cultural information. 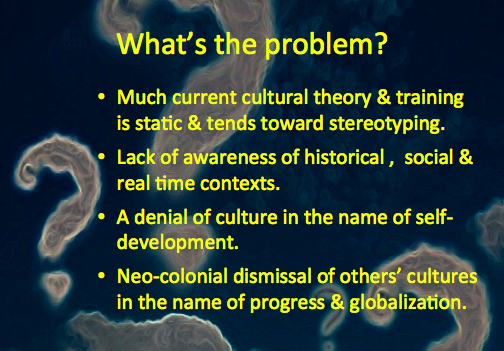 A lack of awareness of the social and particularly historical contexts is another way the intercultural thinking and practice can remain static. A lot of people’s feelings about those different from themselves is not simply a matter of their looking or sounding different, and may be anchored in a story of things that happened in the past. Remember, for example, when Yugoslavia disintegrated into smaller states, how politics called into popular sentiment old memories of “what they did to us” 50 years ago, 500 years ago, 1000 years ago, and so on. These memories live in a culture and affect how we react to individuals in other groups. This is to say nothing of social context, particularly now. Since the financial crisis, we’ve been struggling, in a more conscious way than most of us have done in our lifetimes, with those who have and those who have not. This also provides subtext for our communication with each other. A lot of people I work with, particularly many younger people today, have or are encouraged to have an attitude that expresses itself as, “I don’t have a culture,” or “I’m a global person, a global citizen.” This suggests that prioritizing individualism, so strongly promoted in the West, makes it in a way shameful to be connected to our past, to have identifiable roots. This is true not simply of third culture kids (TCK’s), some of whom have been jetsetters while in the womb, but of others, and seems to be part of the educational process. All too many people, and not exclusively the young, have suffered by or are fearful of being labeled, of being stereotyped, as we mentioned above, or they feel a need to disassociate with what feels like the oppression of their origins, their family, religious faith or local context. Having cultural features seems a liability to them, a restriction of freedom. Inability to address this inclination is another point of stasis in intercultural work. An even bigger issue is a kind of lingering sense of better-than-thou-ness, and noblesse-oblige do-goodism that results in a kind of hidden chauvinism, a myopic view of other cultures that too easily infects intercultural efforts and holds them back. Part of this involves interculturalists’ need to come to grips with colonial history and its enduring effects in political and economic terms , not just hand wringing. We are fully aware of having a long history of European colonialism and US colonialism that doesn’t take other people’s cultural and environmental ownership seriously. So we come to enlighten them, to bring them progress, to bring globalization, of course to sell them our products. The need for cultural savvy makes it an important commodity today and this situation begs us to take a larger view. But even more important for intercultural professionals are discovery, exploration and treatment of the psychological residue of colonial thinking in themselves. Failing this, it is hard to imagine our efforts moving forward in the ways we like to think that we intend. Traditionally, in the boilerplate of the intercultural profession, we studied values in what are called “dimensions.” This was our starting point, something for which we are very grateful to the original researchers, people like Geert Hofstede and Edward Hall. In their observations and studies they raised questions and classified the answers. For example, they identified people as more or less “individualistic” or “collective,” “masculine” or “feminine,” “direct or indirect,” according to how people in different cultures reported their likely behavior given similar situations. Their work made us aware of the fact that there were areas of life in which different people had different ways. Yet, on the other hand, the resulting value labels were a product of Western academic mentality, an attempt to understand other people on our own terms rather than on theirs. This may have been the key to the antechamber of understanding, but leaves us standing in front of a second locked door. In sum, five road blocks, often in combination with each other, that challenge intercultural thinking and practice. Will social media change our static habits? Perhaps so, because they regularly confront us with evidence from around the world, literally at our fingertips, that may challenge these notions. Yet confirmation bias, our ability to see only what we know or expect to see and make otherness fit into it, is likely to be operative in the online world as well. What think you?